A new National Disaster Management Office (NDMO) building for the people of Torba Province was officially opened last Friday. Minister of Climate Change, Ham Lini, led a delegation to Torba on Friday to open the building. The new building accommodates three offices, one server room, one conference room, one storage room, reception space, toilet and bathroom. The total cost of this new facility is Vt25 million and was funded by the European Union through the assistance of the World Bank. The main aim of this project is to increase the resilience of communities in the country. The creation of the Tsunami Response Plans for Port Vila and Shefa Province will benefit communities to response effectively to any future tsunami warnings. There are 21 CDCCCs for Port Vila Municipality Ward Councils and 28 Committees created within the South Efate Area Councils, which covers Eratap, Erakor, Pango, Ifira, Blacksands and Mele Area Councils under Shefa Province. Over one hundred CDCCC members attended a training workshop last week in Port Vila aimed at building their capacity by knowing their roles and responsibility as CDCCC members within their own communities. 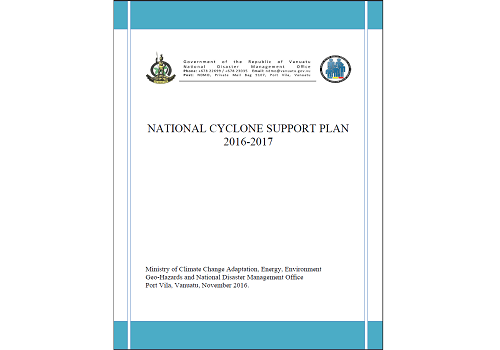 It is a plan that details the prevention, preparedness, response and recovery arrangements in the event of a cyclone impacting on the Republic of Vanuatu. This plan clearly states out the guidelines and information to all responding agencies on what needs to be done in coordinated planning during a cyclone in line with the National Disaster Management Act NO 31 of 2000 and the Disaster Risk Management National Action Plan 2006-2016. Vanuatu is the world’s most at risk country for natural hazards, according to a UN University World Risk Index. A proof to that study result is the passage of devastating Category 5 Tropical Cyclone Pam (TC Pam) in March 2015 where numbers of lessons learned have been raised and discussed amongst humanitarian bodies as recommendations and way forward. On March 13th 2015, Vanuatu was hit by a category-5 cyclone (Tropical Cyclone PAM) that struck half of the country and caused heavy damage. This event revived public awareness of necessity of cyclone preparedness and action on climate change. Seasonal variation in rainfall is fairly high, with the dryer months occurring from June through September. This dry period coincides with the cooler months. Tropical cyclones usually occur in the warmer months, November through April.Torba Province is also vulnerable respectively to anomalously long dry spells and prolonged wet conditions associated with the El Niño (warm phase) and La Niña (cool phase) of the El Niño- Southern Oscillation phenomenon. Recently in 2015/2016, Torba Province has been affected by El Niño drought, resulting in shortage of water and food. Torba is also highly vulnerable to otherextreme climate events including storm surges, coastal, river flooding and landslides. Sea level is rising by over 6mm per year across the province and ocean acidification is occurring as well as yearly coral bleaching events. These climate related impacts are causing food insecurity and other livelihoods issues throughout TORBA.